Blueberry Muffins - Chocolate Chocolate and More! Blue Berry Muffins, one of my family’s favorites! I really love participating in this challenge. Finding the recipe, meeting new bloggers, seeing all the different twists on the same idea. Tina from Mom’s Crazy Cooking works so hard every month coming up with the challenge, e-mailing us updates and reminders, then on post day linking up everyone’s posts. Want to join in? It’s easy, just click here and Tina will take care of you! All wonderful recipes I found and tried through other blogs, not to mention the recipes everyone else found! So to find my recipe, I went to Pinterest. Clicked on the little search button and enter blueberry muffins. Oh wow. All the choices. I’ve pinned several I want to try. I can’t wait till my blueberries come in this summer. I decided on this one from A Cook’s Quest. It just spoke to me, that’s all I can tell you. In a medium saucepan place 1 cup blueberries, 1 teaspoon sugar and 1 tablespoon water. Let simmer over low heat, stirring occasionally. Once warmed, use a potato masher and mash the berries. I left a few small lumps of berry. Just easier. Continue to simmer until sauce simmers and becomes jelly like. Remove from heat and let cool. In a small bowl combine topping ingredients. Set aside. In a large bowl, whisk flour, baking powder and salt together. In another bowl, I used a large measuring cup, combine eggs and remaining sugar, whisk well. Add melted butter and oil, whisking again till combined. Add in buttermilk and vanilla. Stir well. Add blueberries to flour mixture and stir to coat. Pour buttermilk mixture into flour mixture, stir just till combined. Small lumps are ok.
Add a teaspoon of your blueberry jelly to each cup, carefully swirl jelly into muffin using a chopstick or other narrow utensil. I used a lollypop stick. Now top with streusel topping. Bake in a preheated 425 degree oven for 17-19 minutes. Until golden and perfect on top. Remove from oven and let cool in pan 5 minutes before removing to wire racks. My youngest ate 7 of them in one day! And there were cookies in the house. Just look at all that blueberry goodness. 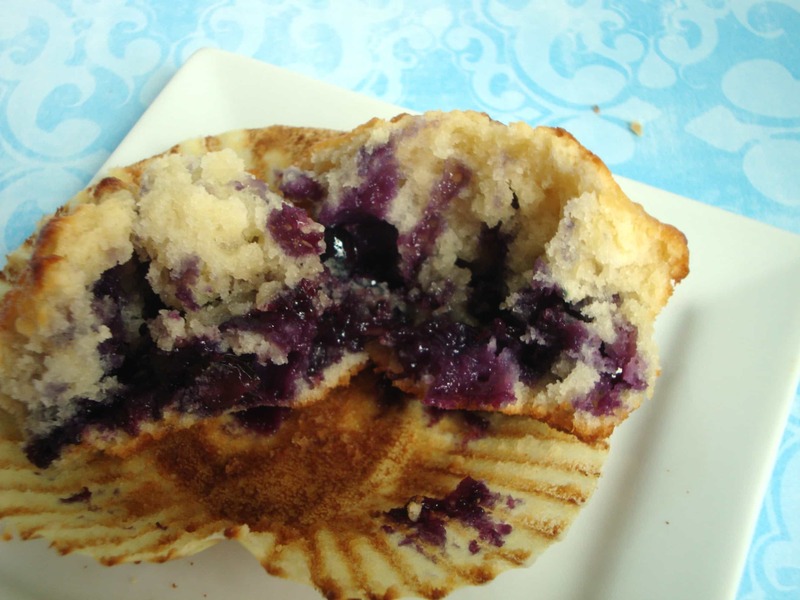 Be sure to check out all the other wonderful recipes for blueberry muffins in the links below. These sound a lot like the ones I made. They also had the jelly~so unique. These look beautiful, and I love the streusel topping! They look wonderful, Joan. I love how you do the tops. Looks so tasty! Wow! 7 muffins in one day! I bet I could do that with these! YUM! I love muffins that have a topping! It looks like we made the same recipe. I think your muffins turned out very yummy. I love the idea of swirling the jelly on top! Wow! So many blueberry muffins are called the “World’s Best” or “Best Ever”, but the blueberry filling and streusel topping put these over the top! Yum! Hope you’ll check out my entry. Hey Joan! Blueberries and buttermilk are two of my favorite muffin ingredients. I like how you used blueberry two ways in this recipe. I also thought the topping on your muffins looked yummy. I would not worry about the lack of crumbles. These look SO GOOD! I’m with you–my kiddo and hubby would definitely pass up cookies for muffins like these! Oh, I love the double blueberry addition!! I have to make these now!! Sure wish that I could eat blueberries as your muffins look wonderful. If you haven’t already, I’d love for you to check out my CCC entry: #11 Skinny Blueberry Lemon Poppy Seed Muffins.. This recipe is next on my list! These look so wonderful! Double whammy of blueberry goodness – I love that! Great job! 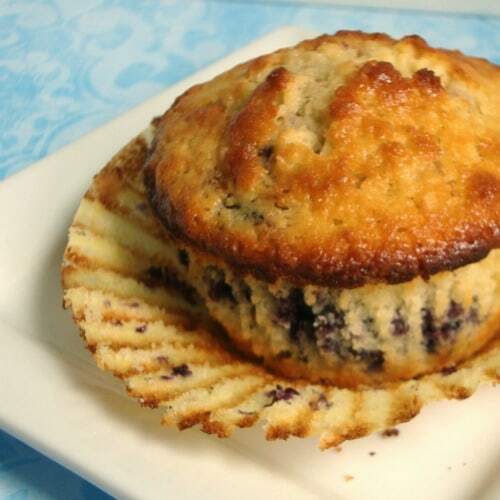 Your Blueberry Muffins look amazing. Can’t wait to try the recipe. I am a new follower. Found you through the Crazy Cooking Challenge (I’m #77) and would love it if you stopped by my blog. I am going to make your Coffeehouse Coffee Cake Muffins for breakfast right now! Thanks for sharing. Have a wonderful day. I think I’d eat seven of these in one day too. These muffins look so good!! The topping looks great! Stopping by from CCC#41. Wow, all that blueberries! Blueberries are not so common here in Thailand, otherwise I’d have them everyday. So that’s how you make the jelly spread throughout the muffin and not stay in one place! They look so delicious! This is my first month in the challenge and I’m so glad I joined, this has been so fun. 🙂 If I could change only one thing… it would be that I still had some blueberry muffins around, LOL!